Public awareness of juvenile arthritis remains limited. Ordinary people are often surprised to learn that arthritis affects children and toddlers, not just adults, athletes or the elderly. In this issue, we shed light on this serious and woefully misunderstood aspect of arthritis through data, testimonials and inspiring stories. In the United States alone, more than 300,000 children suffer from childhood arthritis, the majority of whom are diagnosed with Juvenile Idiopathic Arthritis (JIA). Idiopathic refers to “cause unknown”, underscoring the lack of clarity regarding the specific culprits responsible for disease onset. Left untreated, childhood arthritis is debilitating and can lead to permanent damage with lifelong, dire consequences. Of note, given the young age of afflicted patients, the opportunity cost associated with this disease is too high when assessed in possible reduction of lifetime earning potentials, education attainment, personal happiness and the overall quality of life. Indeed, arthritis in children needs special attention from medical foundations, government agencies and all concerned stakeholders. i) The total number of published studies in childhood arthritis is still small compared to other debilitating or chronic childhood diseases. 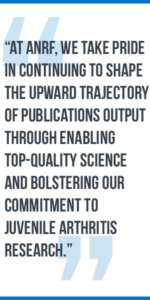 ii) The process of translating published scientific data into cures is not straightforward or linear. 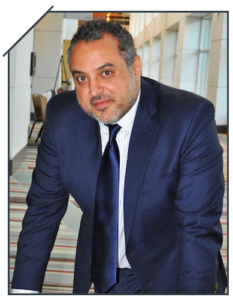 Knowledge gained from promising studies take years to get into the clinical setting for results must be validated, analyzed and reproduced. 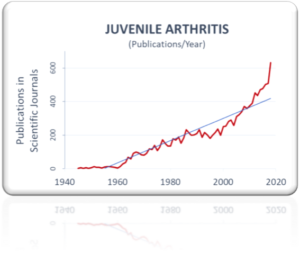 At ANRF, we take pride in continuing to shape the upward trajectory of publications output through enabling top-quality science and bolstering our commitment to Juvenile Arthritis research (read more here and see annual report). Remarkable are the stories of resilience we receive from children with arthritis and their families every day. Against all odds, they refuse to be defined by their diagnosis and go on to achieve great things. For this issue, we compiled many stories and features to share with our community. Prepare to be inspired! My name is Dr. Stephanie Vondrak. My daughter was diagnosed with JIA at age 16 months. She is now 10 years old and has struggled with the disease since diagnosis. I am interested in pursing research related to comorbid conditions in JIA patients like airway obstruction and food sensitivities. If you would be interested in discussing some possible research ideas with me, I would love the opportunity to speak with you. My email is stephanie@drvondrak.com. Thank you for your dedication to helping kids like my daughter. Thank you for reaching out and we’d be happy to discuss this with you. We will reach out via email soon and please also review our grant guidelines at https://CureArthritis.org/grants to see if any funding would be a fit. Thanks! Thank you so much for reaching out and I am so sorry to hear about your daughter’s diagnosis. I will reach out to you shortly on the address you provided.